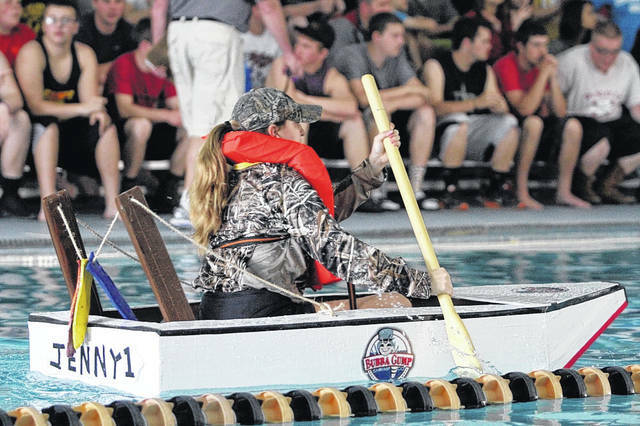 BUCYRUS — After unseating four-time champion Crestline in 2017, students from Colonel Crawford High School are looking to retain the coveted Traveling Oar trophy during the 2018 Card Board Boat Regatta competition. This year’s event will set sail at 10 a.m. on March 26 in the William Ferrell Natatorium at Colonel Crawford High School. The 2018 field includes longtime competitors from Buckeye Central, Colonel Crawford, Crestline, Lucas and first-time challengers from Bucyrus. In addition to the overall winner, prizes are awarded for the Fastest vessel, Most Buoyant, Most Creative and Best Engineered. Last year’s competition featured an Administrators Race between Buckeye Central principal Mike Martin and Crestline principal Keith Strickler, a competition that is expected to continue this year. The Card Board Regattas organized and sponsored by Pioneer Career & Technology Center. Four of the five schools competing in the event have Pioneer Career & Technology Center satellite programs that participate in this event.